Wow! The first part of 2017 has just flown by! 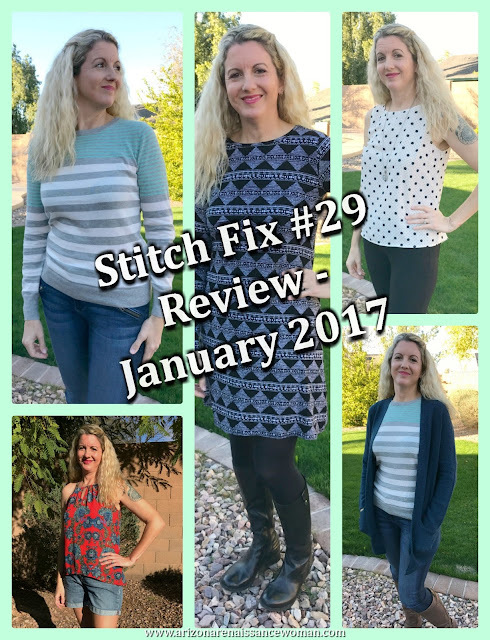 I just barely got back on track with my blog and it's already time for another Stitch Fix review! If you checked out my last one, I'm sure you noticed that I took about a 6-month hiatus. I was receiving fixes during that time; I just wasn't reviewing them. 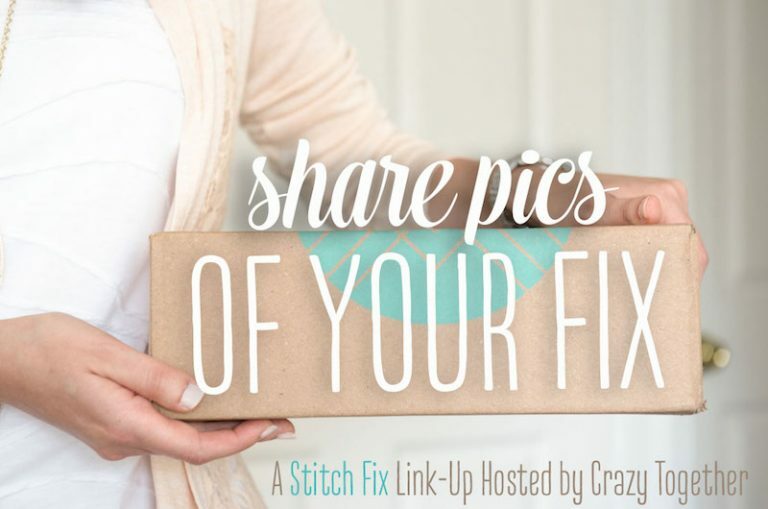 I've found that Stitch Fix is a fun experience to share, though. I always enjoy trying everything on, attempting to find a spot in the backyard with decent light, and forcing my husband to take pictures of me. Ha ha. 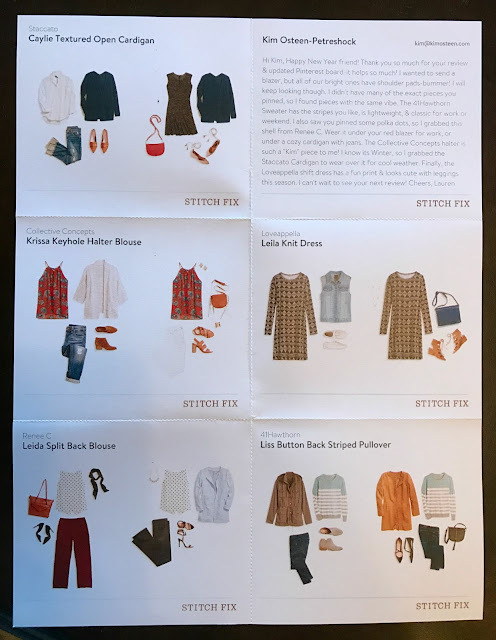 I was pretty overwhelmed with the whole holiday and end-of-semester madness in December, so I did not manage to write my stylist a note or update my Pinterest board before my my last fix. 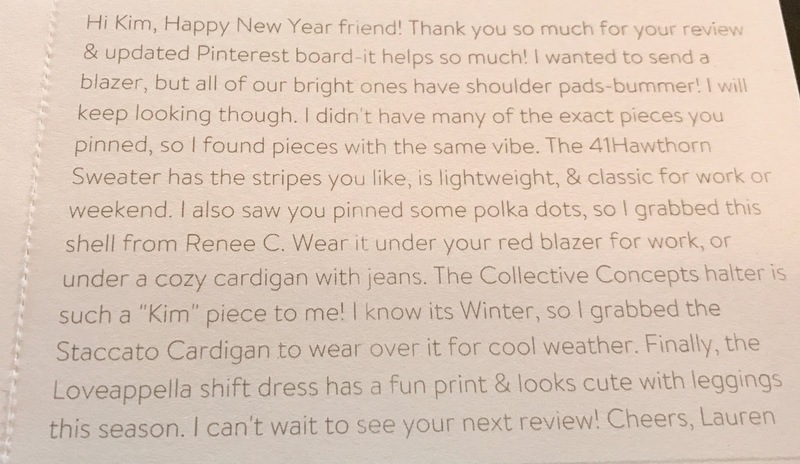 Luckily, Lauren still picked out some great things and I ended up adding a beautiful top to my closet! This time, I did much better! 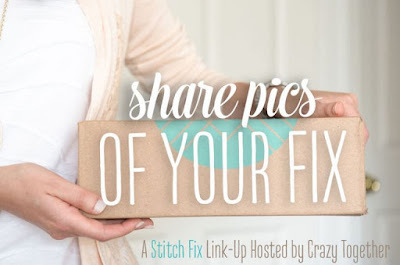 I wrote Lauren a note with some ideas and did a decent overhaul of my Pinterest board. 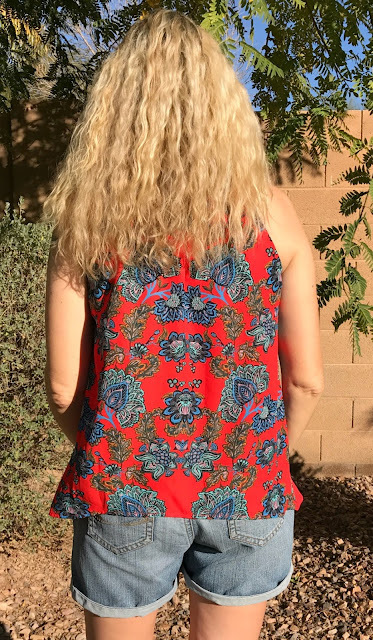 At first glance, I was excited about the halter top, the dress, and the split back blouse! Well . . . here's how it all turned out! Sorry about the shadows! The light was pretty weird when I these pictures were taken and it was hard to find a good spot. Oh, well. At least you can see the top! I can see why Lauren picked this for me. It's definitely my style. I love bright colors, and this orange/red background with the beautiful (but not too-girly) flowers seemed right up my alley. I probably could have figured out a much better way to style this. Cute jeans? Nicer shoes? In all honesty, though . . . this is probably how I would wear it. Denim shorts and Converse! The fit was perfect. I was also glad to see that it was polyester, not rayon, so I could count on it NOT shrinking! Here's a shot of the back that also contains a closer view of the pattern. Lauren did suggest that I try this top with the cardigan. However, I just knew I would never wear it like that. 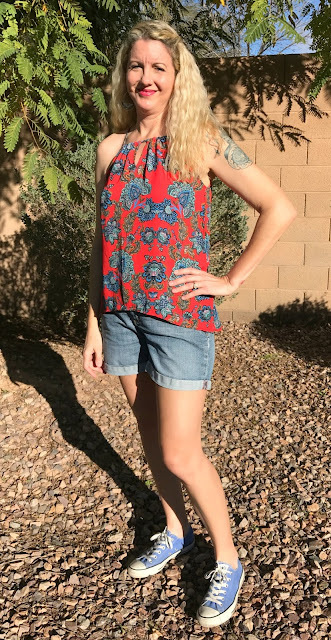 To me, this is a spring and summer top. The only bad thing about it is that it will probably just sit in my closet for a couple of months. That's OK, though. Those hot days will be here in no time! This was an easy decision. As you can see, I moved to a new spot. The shadows got even crazier, so by the time I got to my second outfit, I had to switch things up! I was really excited to try this split back top! I knew it would be a perfect for either work or casual wear. 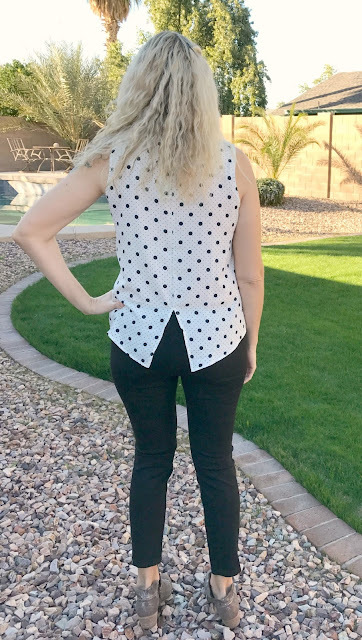 I love polka dots and I could already think of several items to pair it with. I decided to go with the Liverpool Anita Skinny Pant that I received in my September 2015 fix. The top did fit, for the most part. Unfortunately, I felt that the split back came up a bit too high for me. If I bent over at all, my back was exposed. I wouldn't wear it to work like that, and I didn't want to have to wear something under it. I knew that I might wear it as part of a casual outfit, but something about the fabric and pattern combination was just saying "work" to me. It didn't work for work, so I decided to pass! I immediately liked this dress. I prefer dresses without a defined waist. I'm tall and I have a long torso, so I seem to have better luck with swing or straight style dresses. I liked the pattern and the soft knit seemed comfortable but thick enough to provide some camouflage. I hate knit dresses that cling to every lump and bump! 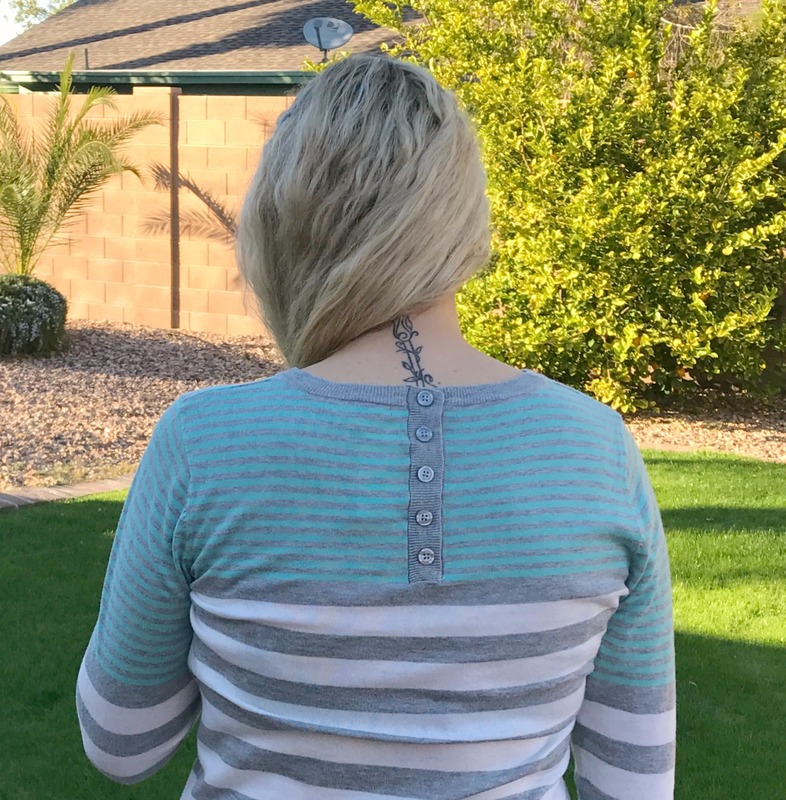 Here's a shot of the back of the dress. I have to say - that pattern was pretty good at the whole camouflage thing, too. 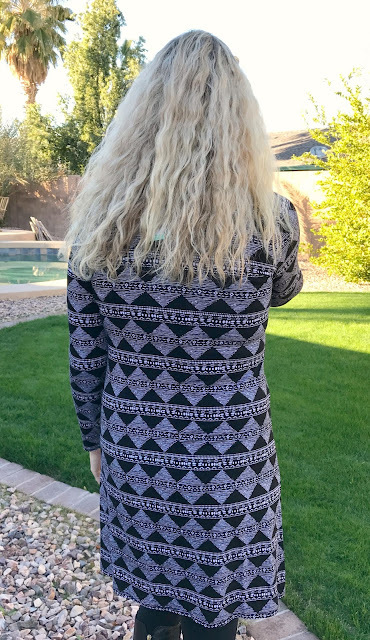 There have been times when I've seen a shot of the back of a dress and thought, "Nope." Ha ha. Well, it wasn't bad. I just wasn't super excited about it. 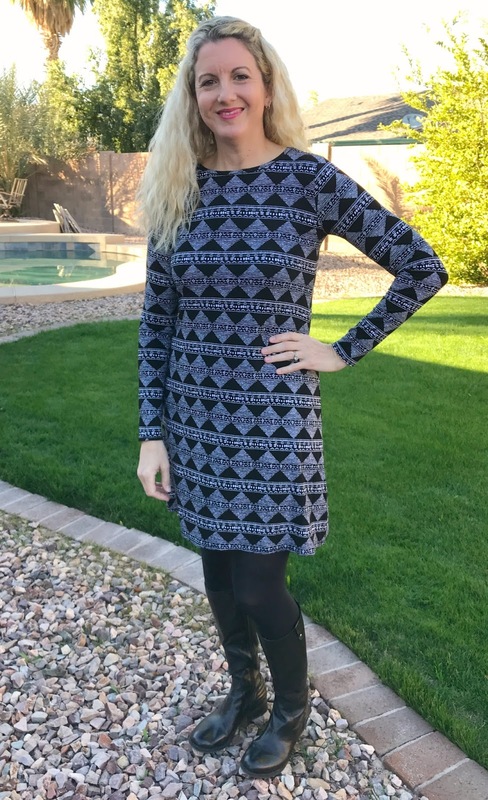 My husband called it a work dress. Well, I don't actually wear dresses to work all that often. And the fact that he called it a work dress kind of takes the excitement about wearing it as a date-night dress. Oh, well. 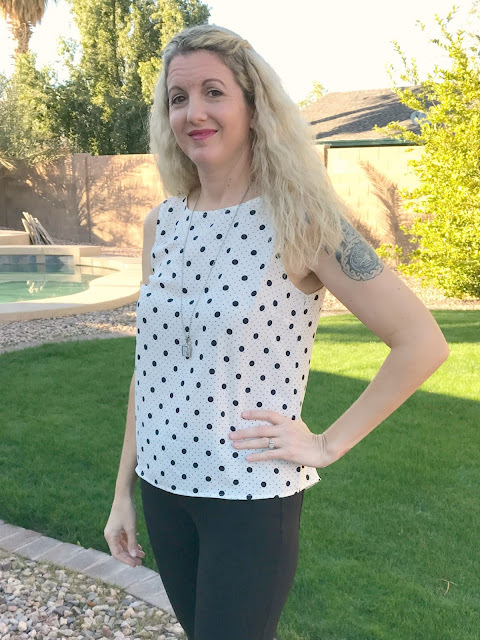 Seriously - no one dresses up for anything in this town anyway, so my date-night outfits often look like the halter top/shorts/Converse combination that I wore in the first photo! 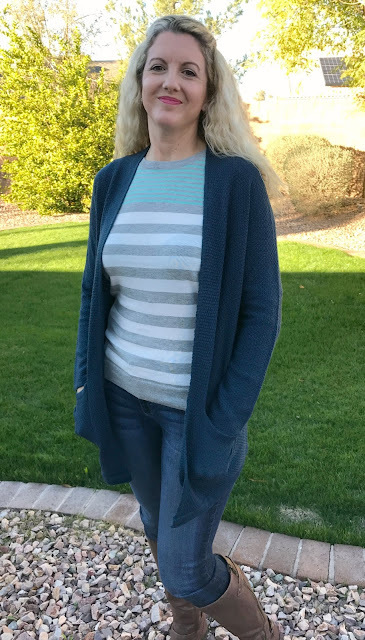 This cardigan was a pretty shade of blue. It seemed rather thin to me, which isn't necessarily a bad thing in Arizona. However, this was more of a throwaway, lower quality kind of thin. I got the feeling it might fall apart if I threw it in the wash.
Once I put it on, I noticed that the sleeves were just a bit too short. That sealed the deal for me. I need long arms! Too bad, though. I liked it more than I thought it would. Honestly, if I had loved the other four items, I might have kept it. As you can see, I chose to wear my other favorite pair of riding boots - also Steve Madden. I don't know what it is about that brand - maybe they work for me because I have rather narrow feet and calves. If you're the same way, you might want to check them out. Here they are on Amazon! 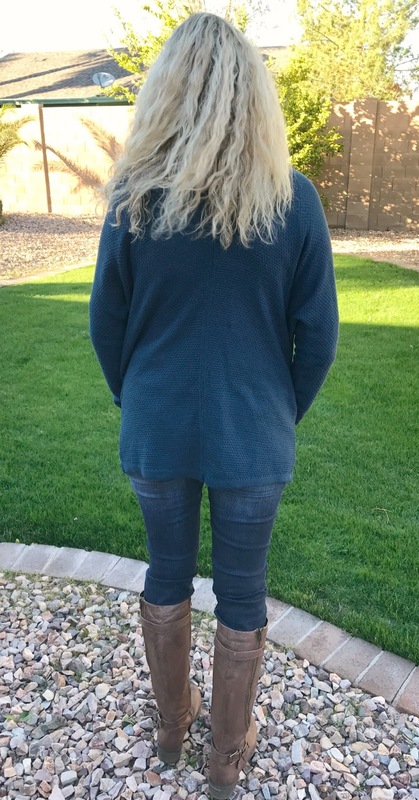 I also wore the Kut From the Kloth jeans that I received in my very first fix. There are still working quite well for me! Anyway, back to the cardigan. Nah, not really working for me. Oh, well. 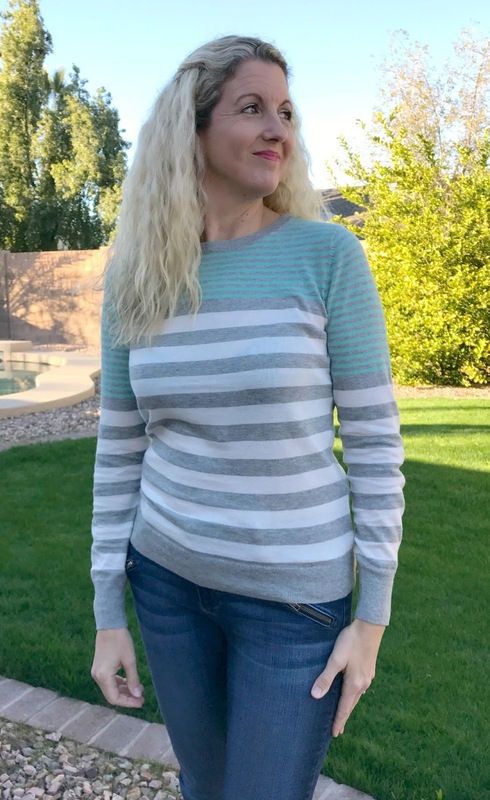 I do like stripes. Lauren was right about that! When I first saw this sweater, though, I just didn't go for it. The combination of the mint pastel and light grey just seemed kind of . . . frumpy? I don't know. Either color is fine by itself. I just didn't love them together, and I'm not sure why. Hmmm. The back had some cute button detail, which I also usually like. This was a very thin sweater. Again - not a bad thing in Arizona, but it was pretty see-through. The flimsy fabric was super clingy. Remember what I said about knits, and how they sometimes stick to every lump and bump? Yeah. I just didn't feel good in this. It wasn't awful, but I think there are many other striped sweaters that would look much better on me. Someone else would love this; it just wasn't my cup of tea! So this fix was a 1/5 (which is still a win), and I'm super excited to wear my new top. In March, maybe. Ha ha. No, really - it's perfect. Around here, it's summer for 8 months out of the year, anyway! 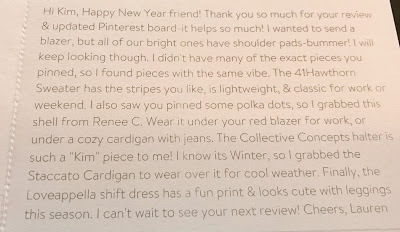 I'm excited to see what Lauren will send my way next time!